Anya what are — have you thought this through? Yeah, what is it you seek Stone B? Is it the Barrier stone? Is Anya really going to give it to him? Unlikely that he seeks the barrier stone: as he said, this is his world and because of that he already knows all the memories of Anyalin, Kohjen, TORIS, and no doubt thus knows that Koris jumped holding the barrier stone and it was thus in the pile of bones. More likely he does seek it, not to have it in his possession, but to eliminate it, destroy it or its powers. Also why would he want the barrier stone? it was used to “trap him below” in the past, or rather to protect Noridun from his attacks according to well door’s decoration. Currently it does nothing more than keep the *other* daemons inside Noridun, which is quite big as we saw, and which they now control. Maybe he seeks the barrier stone because he wants it destroyed. No barrier, means freedom. He can have more power. I expect the “we are not that unlike” moment. The Humans want power, the sentient demons want power. If not that then maybe freedom to return to the demon world. We see the jelly like demons enter and exit stones, but not those taking a solid, human, sentient form. Maybe he’s bound here as long as he’s got human memories to tie him in the human world. Uhm, late thought: because it is infested by a ravenous demon, the barrier stone is actually a trap, and as know from the memory where CANATOPIS took the name and memory of TORIS on the city wall, demons can eat demons. If Anyalin’s plan is to give the barrier stone to Stonebreaker, that might rather end badly for it. That could be possible, or it could be he absorbs power from all demons, like a hive mind queen thus knows everyone’s names who encounter a demon. Also that may have something to do with him growing and increasing in power as the ages went by. 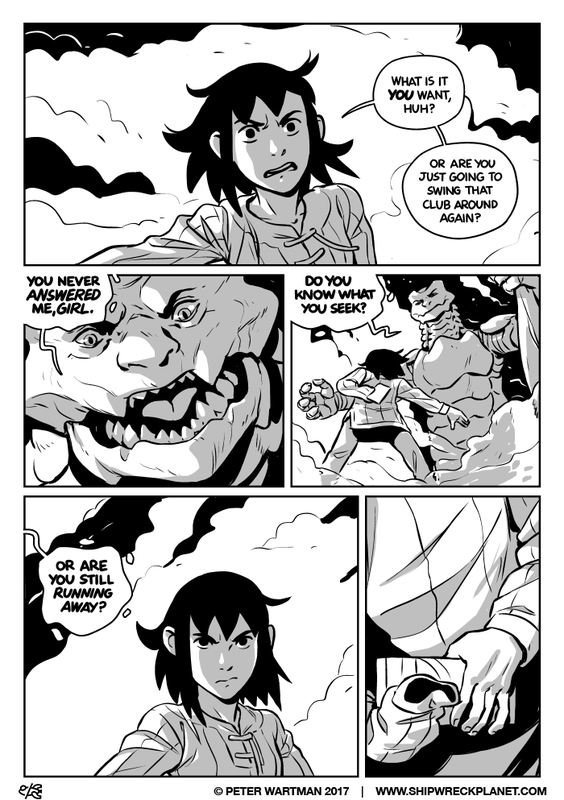 I’m not convinced yet (unless the new page reveals something) the “ravenous” demon wasn’t sent by the stonebreaker or used by him somehow as an attempt to catch Anya. But now that she has her bare hand on the stone, this will be interesting to see what happens, if she willingly lets herself get taken.